The White House and IRS are entangled in a sticky court case with major political ramifications. It concerns allegations that the IRS illegally shared private taxpayer information with the White House related to conservative individuals or organizations. The Treasury Department said this month that although it has found a cache of documents that may be pertinent, it is not allowed by law to release them. The question now is who can find out whether the Obama White House has in effect weaponized the IRS, turning it into an agency that targets Americans out of favor with the administration. Most likely, for reasons outlined below, Congress will have to be the one to find out. While we are far from knowing if any violations of the law have occurred, this is a serious issue. Misuse of the IRS was an article in Richard Nixon ’s impeachment—and he was only accused of trying to politicize the tax agency. In March 2012 the conservative legal group Cause of Action filed a Freedom of Information request, asking the IRS for documents, including emails showing any disclosures of confidential taxpayer information to the White House. 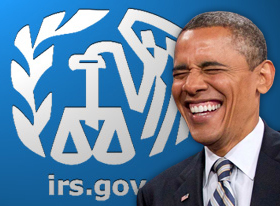 Predictably, the IRS and Treasury stonewalled the request. After the normal administrative requests and appeals failed, Cause of Action launched a federal suit. They wanted all the documents and any correspondence related to the IRS’s refusal to hand them over. The IRS responded that it was exempt from such disclosures and that releasing the files would impede its own internal investigation. In September Judge Amy Berman Jackson of the U.S. District Court for the District of Columbia ruled decisively against the administration. The judge, an Obama appointee, said the plaintiff is entitled to see any relevant documents and ordered the Treasury to search for them. The office of the Treasury inspector general for tax administration, which oversees the IRS, announced in late November that it had found some 2,500 relevant documents. It said it would produce them by mid-December. Now Treasury has clammed up again, trying to keep its contacts with the White House secret and reiterating that it is exempt from disclosure. The administration has offered a bizarre rationale: It would be illegal to turn over documents the IRS shared illegally since it is illegal for the IRS to share the files with anyone, including the court. There still is a wide gap between our knowing that there is a cache of “responsive documents” and anyone establishing a direct connection between White House political operatives and the IRS. However revealing the documents may be, they would need to be followed up by interviews and depositions, which may lead to more documents. Only a thorough investigation can accomplish that. A politicized Justice Department cannot be trusted to conduct an impartial investigation or to appoint a reliable outside prosecutor. This means that any serious inquiry is up to Congress. Republican leaders are understandably cautious about this approach. When they take control of Congress in January, their overriding goal is to establish a track record for governing, not a pattern of investigating the Obama administration’s past transgressions. But this case should be an exception. Any White House interference with the IRS is a fundamental assault on the rule of law and the disinterested application of the tax code. If allowed to stand, it will serve as a pernicious precedent for future administrations. Congress should proceed carefully but steadily. First, see if Judge Jackson secures the IRS documents for Cause of Action. The agency could appeal her ruling and delay for a few months, but it cannot simply refuse a judge’s order. To ensure that the documents are not heavily redacted, Paul Ryan and Orrin Hatch, respectively the new chairmen of the House Ways and Means Committee and the Senate Finance Committee, should exercise their unique legal right to review the raw documents without deletions. If stymied, they too should sue. If the documents show repeated, politicized contacts between the IRS and the White House—and only then—the House and Senate should vote to establish a joint congressional committee to investigate. The committee’s senior members should be seasoned prosecutors, aided by outside counsel with deep experience investigating white-collar crime. Such a body would raise the issues before a skeptical or hostile mainstream media, and overcome the disorganized grandstanding that undermines so many hearings. The heavy lifting, particularly taking depositions under oath, should be done behind closed doors, beginning with lower-level people who might have seen unauthorized documents or their political uses. Give them transactional immunity and make clear they face serious legal peril if they fail to testify fully and truthfully. Then follow the chain of testimony up the organizational chain. A well-conducted investigation would either clear the White House’s senior political aides or implicate them in serious wrongdoing. The search for the truth here ought to be a bipartisan issue. It may yet become one as Democrats back away from the Obama White House. Mr. Lipson is a professor of political science at the University of Chicago.